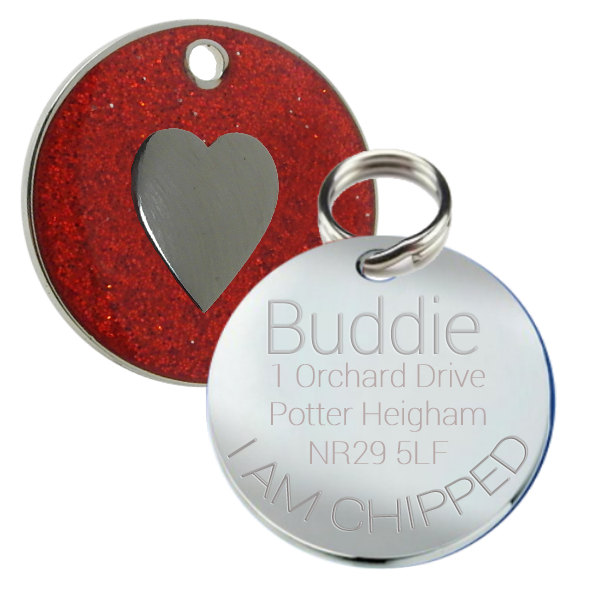 Our Red Glitter Pet Tags are made from nickel plated steel and are grade 1. This means we only buy the top quality in these tags as they have the thickest nickel plate available and not seconds. and the glitter is sealed in with a polymer epoxy coating. I will engrave 5 Lines of Text. I recomend only 13 characters per line so the text does not come out to small. All our pet id tags are deep engraved so you can be sure your contact details will not wear away. All our pet tags come complete with a strong split ring for easy fixing. This product has a minimum order quantity of 0.